As the sort of person that can get addicted to deep technology discussions about the latest thing, without due care and attention I could easily fall into the pit of storage related technologies. From the storage bits through to software defined cache hierarchy, there is so much to learn and to talk about. Over the last two years, unless you were living under a rock, it would have been hard to miss the level of attention that Intel's 3D XPoint technology (a co-venture with Micron) has been getting. Billed as a significant disruption to the storage market, and claiming an intersection between DRAM and SSDs as a form of non-volatile storage, many column inches have been devoted to the potential uses of 3D XPoint. Despite all this talk, and promises that Intel's Super 7 partners are well under way with qualifying the hardware in their datacenters, we are yet to actually see it come to market - or even be actively demonstrated in any sizeable volume at a trade show. 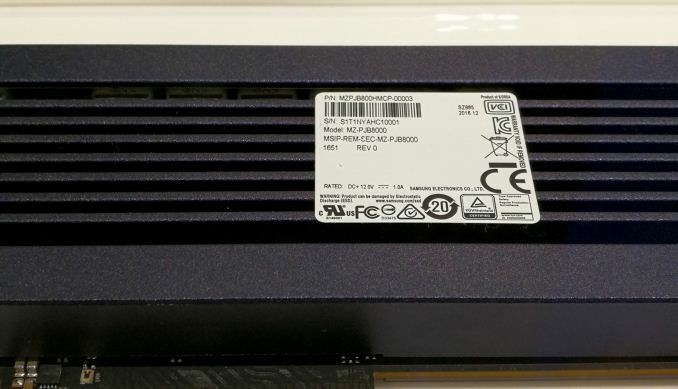 We're expecting more information this year, but while everyone is waiting, Samsung has snuck up behind everyone with their new Z-SSD product line. 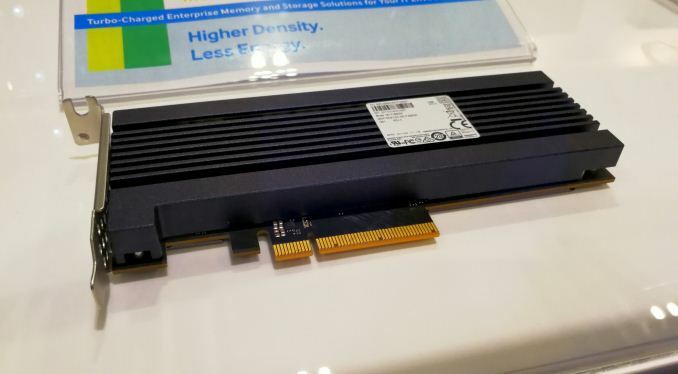 The Z-SSD line was announced back at Flash Memory Summit, although details were scant. This was a PCIe NVMe storage technology using Samsung's new 'Z-NAND', which was aimed at the intersection between DRAM and SSDs (sounds like 3D XPoint?). Z-NAND is ultimately still baked in as NAND, although designed differently to provide better NAND characteristics. We still don't know the exact way this happens - some analysts have pointed to this being 3D NAND/V-NAND running in SLC mode, given some of the performance metrics, but this is still unknown. 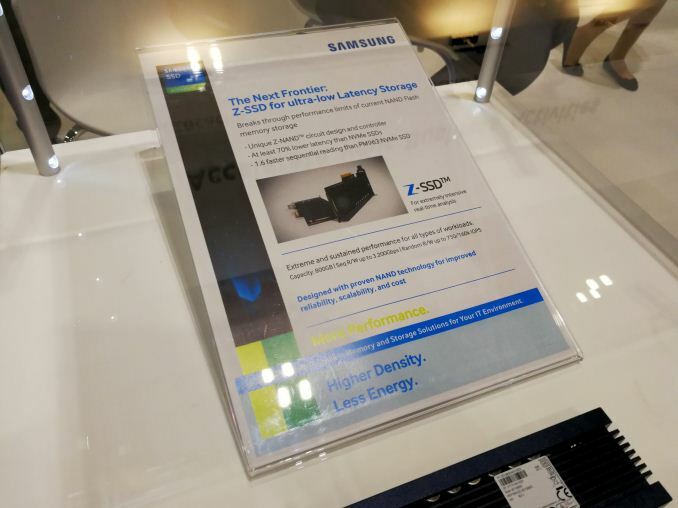 At Cloud Expo Europe, Samsung had a Z-SSD on display and started talking numbers, if not the technology itself. The first drive for select customers to qualify will be 800GB in a half-height PCIe 3.0 x4 card. Sequential R/W will be up to 3.2 GBps, with Random R/W up to 750K/160K IOPS. Latency (presumably read latency) will be 70% lower than current NVMe drives, partially due to the new NAND but also a new controller, which we might hear about during Samsung's next tech day later this year. We are under the impression that the Z-NAND will also have high endurance, especially if it comes down to fewer bits per cell than current NAND offerings, but at this point it is hard to tell. Initial reports indicated that Samsung was preparing 1TB, 2TB and 4TB drives under the Z-SSD banner. At present only the 800GB is on the table, which if we take into account overprovisioning might just be the 1TB drive anyway. Nothing was said about other capacities or features, except that the customers Samsung is currently dealing with are very interested in getting their hands on the first drives.